With last week’s episode of Awake, the show presented us with the idea that there may be more going on than meets the eye, beyond the show’s already interesting premise. With “Guilty,” Awake deepens the importance of the shifting realities for Britten and his having to balance both for the well-being of both his loved ones. In “Guilty,” Rex, Britten’s son, is being remembered by the metro youth center he used to work at. His wife wants him to go remember their son, but he can’t due to the fact that his son needs him more in his other reality. In that reality, where Britten’s wife is dead and his son is alive, a criminal named John Cooper has escaped his dialysis treatment. Britten, along with his old partner Jim, were the ones to put Cooper behind bars years ago. Now Cooper has kidnapped Rex until Britten can prove his own innocence. “Guilty” takes a different approach to the show’s usual themes. 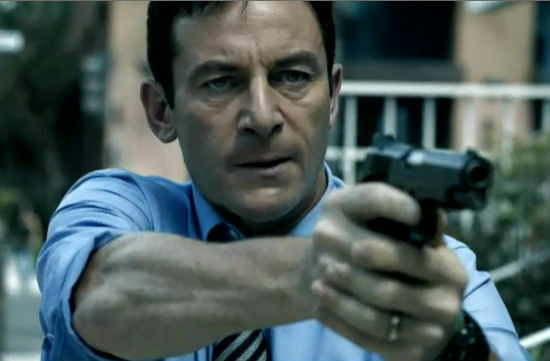 The episode is more action-oriented, like an episode of 24. Cooper is “accidentally” shot right when Britten gets the information he needs and of course, the partner who we have never seen before is the one who had framed Cooper in the past. I do appreciate how the connections between the two universes aren’t always the same. For example, some people made the same choices in both existences, yet others are completely different. It just depends on the week. Isaacs as Britten is better when he is getting ready to burst rather than when he has completely blown his top. In the pilot, we saw Britten constantly hiding his emotions until a moment left him to just completely lose it, and it became the most powerful moment of the show thus far. “Guilty” has Britten continuously at his most stressed and most Jack Bauer-esque. It’s not that Isaacs isn’t good in this state, but the character of Britten isn’t nearly as interesting. “Guilty” also seems to have the most glaring flaws of any episodes so far. Characters pop up at just the right moment, or know exactly where to find certain people, even though they should not have that knowledge. Plus the introduction of Jim just immediately seems like a way for the story to wrap up nicely at the end, something the show has demonstrated before it doesn’t feel the need to do. Not to mention that the show having a kidnapping does seem to be a bit too much for a series that relishes in the little things. “Guilty” also shows the difficulty Britten is having in making everyone happy. By balancing these realities, he is always disappointing someone. When he tries to find Rex, he is keeping his wife out of the loop and also making her attend the fundraiser held in their son’s honor by herself. It’s great to see that Britten has to choose what he believes to be right, but he is seeing that he can’t please everyone. I will also say that I have appreciated the depth of the character of Rex, played by Dylan Minnette. He’s not the typical television teenager, not content to spend time with his family, but rather he is a character riddled with battling emotions, not sure how to deal with those and his growing adolescence. It’s a fine balance that is being played excellently by Minnette and the writers. What has been a great change from other dramas with Awake is that it is for the most part a thriller that doesn’t feel the need to be flashy or over-the-top. “Guilty” toys with the show’s formula a bit, becoming more action- oriented and less about the emotional stakes inherent in Britten’s dual lives. “Guilty” is a fine diversion with a few flaws, but lets hope the show sticks more to its emotional focus rather than action in the future.